Salad bar owner Phyllis Chua has her head screwed on the right way when it comes to eating greens. 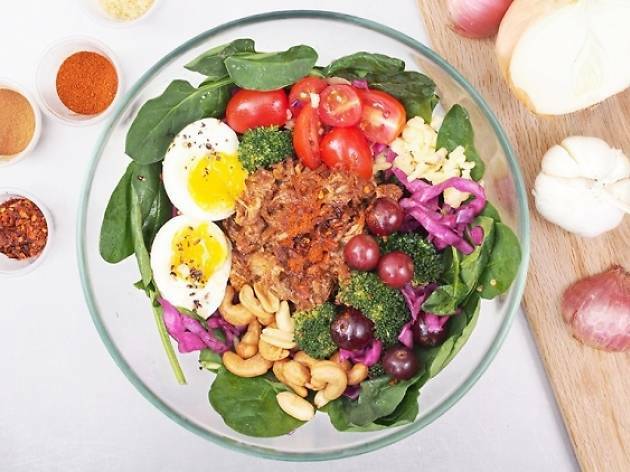 Spinacas’ hearty, Vespa-delivered bowls come with at least 100 grams of warm protein and minimal carbs, so it’s suitable for Paleo adherents and those easily hungry. 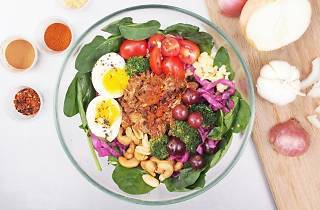 The combos, which include five meats and two veggies, come in two sizes ($9/petite to $11/regular), each with a bed of spinach leaves, an egg and nuts for crunch. Hot options include the 12-hour-marinated Moroccan-spiced chicken and slow-cooked BBQ pulled pork. Takeaways are also available from Spinacas’ Pearl’s Hill kitchen, but order in advance before you pop by.